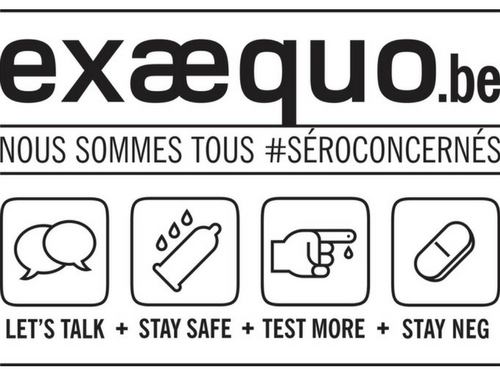 Since more than twenty years the non-profit organisation Ex Æquo is one of the protagonists in health promotion in Francophone Belgium amongst the gays, bisexuals and other MSM’s (men having sexual relations with men, and who identify themselves, or not, with the designation homosexual or bisexual). This struggle evolves, since the available solutions are nowadays more diverse (PrEP, TasP, TPE, contraceptives / lubricants, vaccines, etc.). These persons need a stronger guidance so that they acquire a certain basic knowledge and gain autonomy in assuming responsibility for their health. This mission is followed according to the community approach, which comes down to: to rely upon employable aids (persons and objects) that exist within the community so that the sexual health promotion is realized by and for te mihe couples. In the concrete, our activities are centred around various actions in the field amongst the community, in particular MSM, be it during the festive soirees, in the saunas or the meeting places, but also around the reception of the target public at the health services where a quick and free detection of HIV is offered. Do you fancy becoming a voluntary worker? This website complies to the AnySurfer checklist for accessible websites.